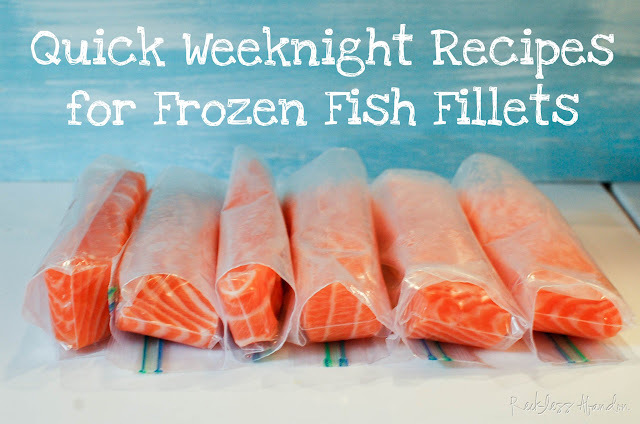 Salmon (or any fish) thaws pretty quickly making it a great weeknight meal option. Freezing salmon in serving sizes has become my lifesaver for a meal in a rush. I'm hungry and want something good for me. Salmon is so versatile as well. I've listed a few of my favorite recipes below. If you pull it out of the freezer it will thaw in less than 20 minutes! That means you can having a filling, fresh dinner in less than 30 minutes. To thaw, just place 1-2 salmon fillets (still in the baggy) in a medium bowl of lukewarm water. Swap the water every 5-10 minutes. Viola! Thawed, ready-to-broil salmon, already sliced in serving sizes. 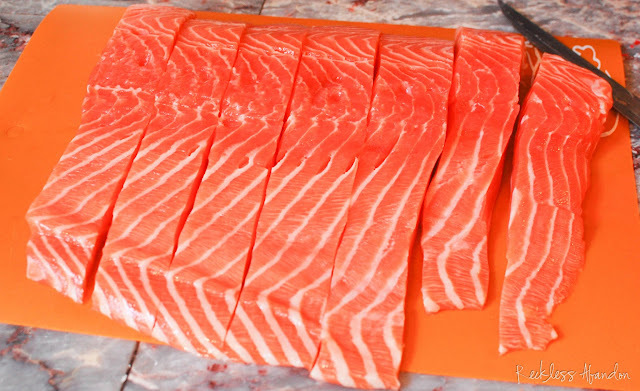 My absolute favorite salmon is Scottish Salmon. You can order it online to be delivered to your door the next day at Chef's Fresh Fish. First, slice your salmon into serving sizes. A good little trick is to use 3 fingers to measure...basically the width of your 3 fingers together will give you a great guide to a typical serving size. Of course you can make them bigger or smaller depending on your preference. Also, you may want to slice thinner parts of the fillet thicker (so there is more fish) and the thicker parts of fillet thinner. That way each serving is about the same amount of fish. Now put each piece in a quart-sized freezer bag. I recommend using the plastic bags that say "freezer" rather than just thin sandwich baggies. 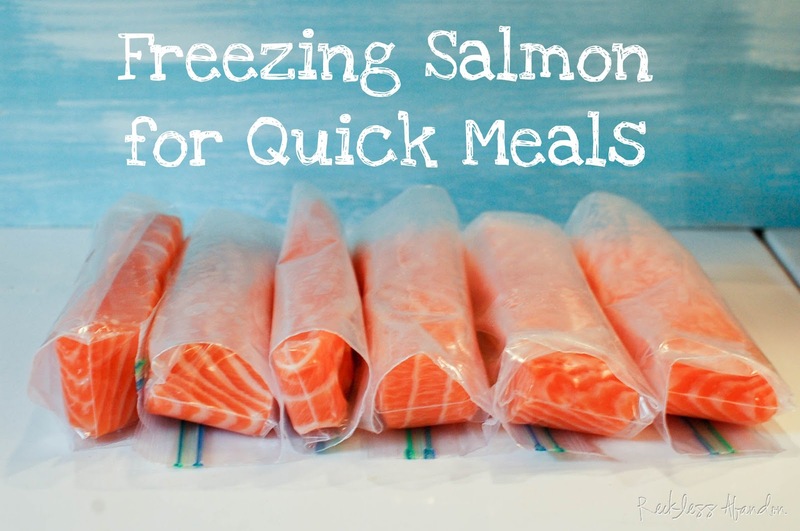 This will help keep them fresh and last longer in the freezer. If you often cook for two (or ever four) put 2-4 fillets per bag. Stuff them into the bottom of the bag trying to remove most of the air. 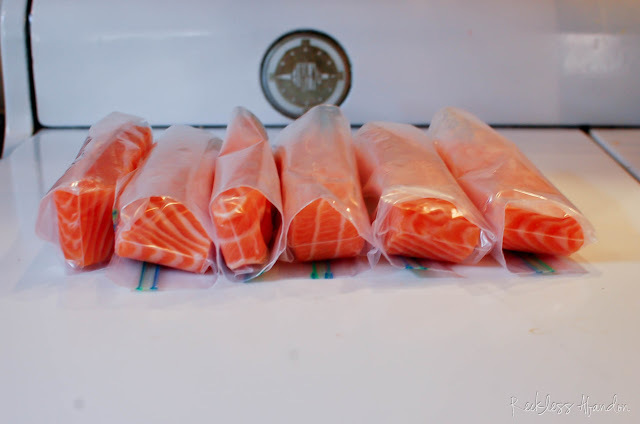 Roll the salmon to the top of the bag, again trying to remove as much air as possible. Seal shut. Follow the instructions above for thawing. You can always remove from the freezer the night before and place in the fridge. It will thaw there throughout the night and next day. They will keep in the freezer for 8-10 months! Click on the image below for Reckless Abandon Fish Recipes.